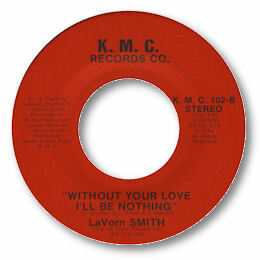 I don’t think anybody would ever claim that LaVorn Smith was one of the great soul artists, or even a first class singer, his rather "choked" approach sees to that, but when he cuts loose towards the end of this gem, screaming his passionate feelings he jumps into the big league. This is clearly the essence of heartfelt music. I don't know if Smith ever made another record, don't know where he cut this one for that matter, but its definitely a 70s recording, a flute intro, a sweet, jazzy guitar filling around the melody - but still deep soul with a vengeance. I get those tell-tale spine tingles listening to him here and since conveying that emotion was what LaVorn intended to do he has created a minor masterpiece with Without Your Love I’ll Be Nothing. I'm grateful to my great friends Michel and Martin Goggin for the extra info. You can read more about Donnie Harley in Martin's excellent article on the Lyrics in Juke Blues #66.